My oh my have have I waited for a Ghost story or what? The answer is yes, yes I have. This book was stunning. My mother read it first and took her time in devouring it to make me wail like cat drenched in water. When it was finally my turn, my customer’s at work just didn’t seem so important. 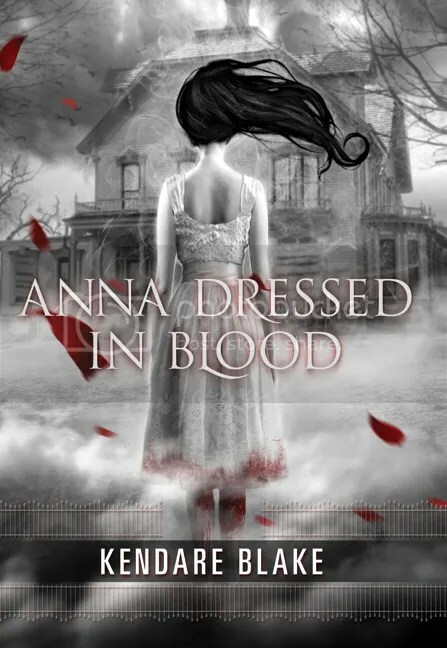 Anna Korlov, or as the residents of Thunder Bay, Ontario know her as, Anna Dressed in Blood had been on a killing spree for quite some time, but this story isn’t so much about her than it is about Theseus Cassio Lowood. Ghost hunter extraordinaire with one bitchin’ name strolls into town with his witch of mother and a cat-spirit detector. After the tragic murder of his father, Cas (as he prefers…such a waste because his name has so much presence!) he took it upon himself to continue the family business. His task being to banish Anna back to where she belongs, but what kind of story would that be if he just up and did that? I liked that despite his constant moving from one places to another, the author didn’t make him out to be this lone-wolf, totally cold and self involved in his own demons. He is sarcastic and witty and knows how to handle himself. I don’t want to forget Cas’ ghost-busting crew Thomas, a psychic and fellow spell caster and Carmel, the queen bee of the school who just wants a little more excitement in her life. Not your average combo but this trio definitely make a great team. I wasn’t expecting to find romance in this book but I wasn’t complaining, it felt like an extra treat in my lunch box. It felt fitting ghost-killer and ghost star-crossed lover much? Think so. Their dynamic evolved very nicely as Cas began to see himself more than just a guy on the job, but a normal teen having his first crush and not being able to stop himself from going up and beyond. As we delve further into the book we find out some frightening things. One of them is what happened to Anna how she came to be trapped inside her own home, that the human soul becomes dark there isn’t always a way to fix it. My mum actually teared over the revelation. Not to say you will, but it’s pretty sad. There be mentions to a secret entity who Cas has been waiting for, the reason for his constant ghost hunting and who has been with him from the beginning. As I keep thinking back on it, I get the willies. Like a baby finding out his toy bear isn’t smiling, but grinning evilly. The story is also incredibly humorous, I didn’t stop laughing and I really appreciated that from Kendare Blake, she balanced out the scary with wittiness. There is a sequel to this book which I purchased because the ending from the first book pulled heartstrings. I am looking forward to how she wraps it all up and so far from other reviews, Girl of Nightmares will not disappoint, but I’ll let you know about that another time. This entry was posted in 2013, Reviews and tagged Book Blog, Dreamingwithink, Fantasy, Horror, Meli, Paranormal, Romance, Young Adult by dreamingwithink. Bookmark the permalink.